Cheryl Gushue premièred her resort 2013 collection of Cascata Blu last Saturday during TIFF. The line features simple yet versatile designs that fit all body types in a wealth of textured, art-inspired prints. I was on hand with my photographer to check out backstage beauty & watch the show. What is Cascata Blu you ask? It's Italian for blue waterfall. I have to highlight the hair. The team from Kevin Murphy Hair worked it out! They used their famous Mermaid Kit on the models. It was the first time I've ever seen the wave clip in action. The WAVE.CLIP is a multipurpose tool that smoothes frizz and flyways on naturally curly hair, enhancing waves to make them smoother. This clip can create smooth waves on straight hair by adding movement without frizz or flyaway’s. 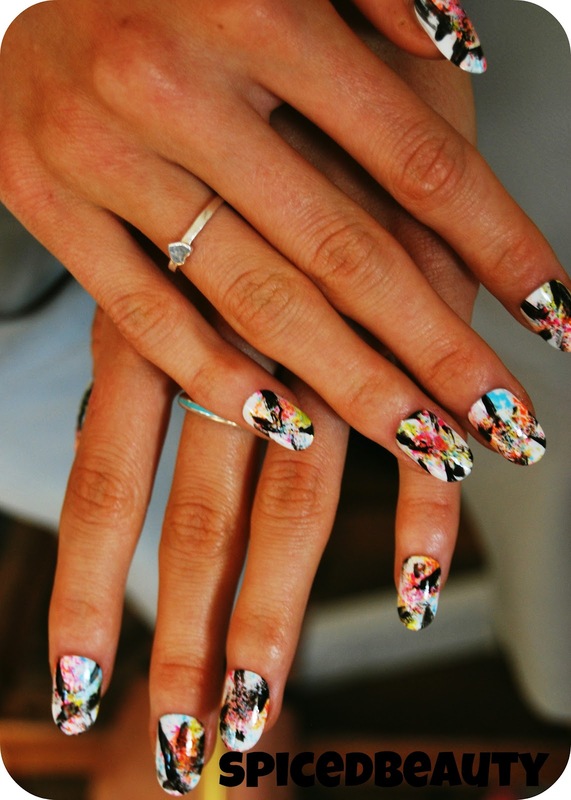 Nail aesthetician Rita Remark re-created nail art to match the graphic fabrics. The show started out with a local graffiti artist painting the model live on a stage. I know you can't tell but it says Cascata Blu on her bathing suit. The Cascata Blu resort 2013 collection has two different themes, Graffiti City and White Sands. They represent the balance between the urban cultures of a bustling metropolis versus the serenity of traveling to faraway destinations. Check out http://cascatablu.com for more information. Amazing, I love the nails!